It feels like the longest wait in Irv Williams’ 97-year old life: The time between getting dressed up and the moment he actually climbs onstage. “Feels like a hundred-thousand minutes,” Williams said with a rueful chuckle. But once someone — usually guitarist Steve Blons — picks him up from the Episcopal Homes, where he lives in St. Paul, the time has a way of melting away. Construction on Nicollet Mall has reduced the size of the crowds for Williams' Friday happy hour shows at the Dakota. But as the years go by, Williams' annual birthday concert has become a hot ticket. 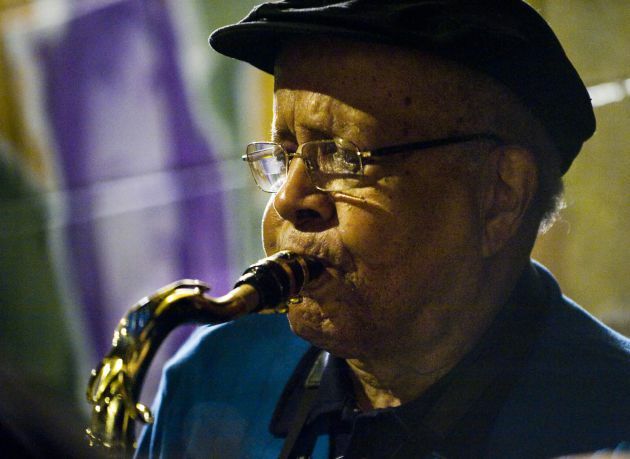 There's sure to be a large, enthusiastic audience when the saxophonist celebrates his 98th birthday there this Sunday. And Irv is sure to amaze with long, sustained notes. He's sure to charm with his signature slide back and forth from one key to another. And he's sure to make the audience swoon with the easy, lilting swing of his trademark breathy ballads. Those in attendance Sunday will hear the oldest working musician in jazz today, someone with direct connection with the foundational figures of the music. Williams once played with Louis Armstrong, and turned down offers to tour with both Duke Ellington and Count Basie after moving to Minnesota in 1942. Coleman Hawkins, widely credited with playing the first saxophone solo in jazz history, personally taught Williams the circular breathing technique that enables him to sustain those long notes. And yet two minutes later, he said he would prefer a schedule of six nights a week to keep his chops honed. So, Irv, when you do finally pass on, how would you like to be remembered? “Oh, that’s a tough one,” he answered.